It's all about the construction. My first job was working at Tecan U.S. writing software for spectrophotometers and liquid handling robots. At the time Lynne and I lived in North Raleigh and my commute took me around the north west part of the Raleigh belt-line. For the entire two and a half years that I worked at Tecan the belt-line was under construction as it was widened from two lanes to three. Of course, that meant that most of the time the road was littered with construction barrels and cones and usually narrowed down to one lane. Two weeks after I left Tecan they finished the widening and all the barrels came down. 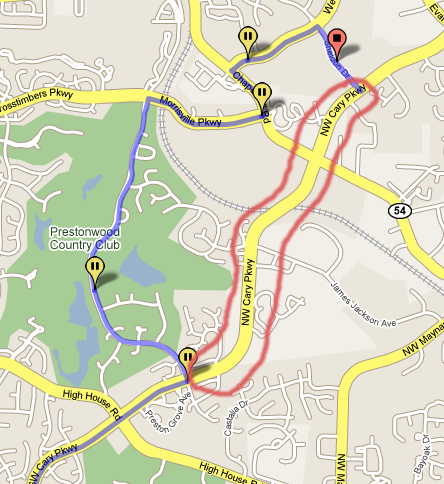 My next job was at MTS writing software for mechanical testing systems, and since we had moved to Apex, the easiest commute was up Cary Parkway, then to wend my way through Preston subdivision. I was thrilled when construction on the Cary Parkway connector was finished and it cut a good five minutes off my commute. Two weeks later they started the process of closing our division and I was laid off. Two for two; I'm starting to get a little suspicious. SAMSys seemed like a safe bet for a place to work, I'd be writing software for RFID readers, it was up in Durham and I'd actually found no construction projects planned along my intended commute. Of course, within the first year the company moved and my new commute took me straight down Route 55, set for widening from one lane to two in both directions. SAMSys went bankrupt, then was bought out of bankruptcy by a competitor, Sirit. Meanwhile the road construction project ran into nearly a year of delays, but once the barrels came down I was laid off from Sirit within a month. And so last year I was hired by IBM. Sweet, my commute would continue to be Route 55, thus ensuring a long career there. What I didn't realize was that the Route 540 extension that was going to intersect Route 55 was under construction and when complete would take a good five minutes off my commute. That new section of road opened up on July 16th. I start at Google at the end of this month. That was the most oblique announcement ever! Best wishes, and have a blast! Was sort of expecting tags around that last sentence. Man Google sure is cleaning up. Good luck with the new commute. Congrats. Seems like all the people I know/follow/respect are now working at Google. Joe, Congratulations! If you're permitted, what is your new role at Google going to involve? Al. Congratulations, Joe! All the best in your new job! Someone start a new road construction project, stat! I predict Joe will jump ship to Microsoft before the end of the month. Amazing! Google seems to really understand the difference between being "on the web" and "of the web." Not only in their technology but also in their hiring. If this keeps up, we may need to limit announcements to those who *do not* get hired by Google. dang! i knew something was up. oh well, c'est la vie. good luck Joe. it was great to work w/ you. albeit too briefly. Congratulations Joe, and welcome to the Googleverse! It has been a pleasure to work with you Joe. Best of luck in your new endeavor!